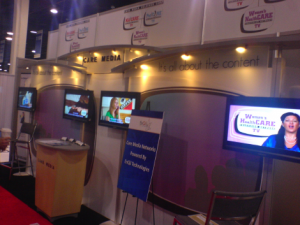 EnQii powered CARE Media Holdings, who provide programming in waiting rooms in the US, at last seem to be shouting about what they have been doing and the nice size networks; KidCARE TV (pediatrician’s offices), Women’s HealthCARE TV (obstetrician’s offices), and PetCARE TV (veterinarian’s offices) that they have built up over many years (they also took a stand at DSE last week of course). Arbitron’s research will be designed to gather information on patients’ awareness, acceptance, and recall of advertising after being exposed to CARE Media in a doctor’s waiting room. The study will provide CARE Media with audience estimates for each network, as well as figures for all three networks combined, that are equivalent to those used by traditional broadcast media. This is actually Arbitron’s third study conducted for CARE Media Networks. Arbitron previously conducted studies for KidCARE TV and Women’s HealthCARE TV – it’s great to see networks take the all important task of research so seriously, we only wish more networks would do so. Arbitron Inc. is a media and marketing research firm serving radio broadcasters, cable companies, advertisers, advertising agencies and outdoor advertising companies. Arbitron’s core businesses are measuring network and local market radio audiences across the United States; surveying the retail, media and product patterns of local market consumers; and providing application software used for analyzing media audience and marketing information data. The Company has developed the Portable People Meter, a new technology for media and marketing research. Arbitron’s marketing and business units are supported by its research and technology organization, located in Columbia, Maryland. Its executive offices are located in New York City. This entry was posted on Friday, March 6th, 2009 at 07:53 @370 and is filed under DailyDOOH Update. You can follow any responses to this entry through the RSS 2.0 feed. You can leave a response, or trackback from your own site. I am at the AAAA’s conference in New Orleans hearing from C level advertising executives that Arbitron has really stepped up to study and understand the business of ad supported digital signage networks. Arbitron seems to have merged their decades of audience measurement and reporting with the new OVAB guidelines, added their understanding of the unique attributes of our industry and created a recipe the agencies and marketing people are comfortable with. Now it’s incumbent upon us, as Place-Based, ad supported, DS executives to take advantage of it. I can also vouch for Arbitron as they’ve shown a real entrepreneurial attitude in this space and many of our customers have benefited from their custom research which has increased their revenue substantially. Neal is a real stand-up guy and it is always a pleasure working with him and the rest of the team at Arbitron. It was a pleasure meeting you at the panel on ad based networks in DSE, Phil. I hope you get the results you are looking for from your research.